The boss of Qatar Airways has accused the U.S. of fanning the flames of a dispute between the country and its Gulf neighbors. 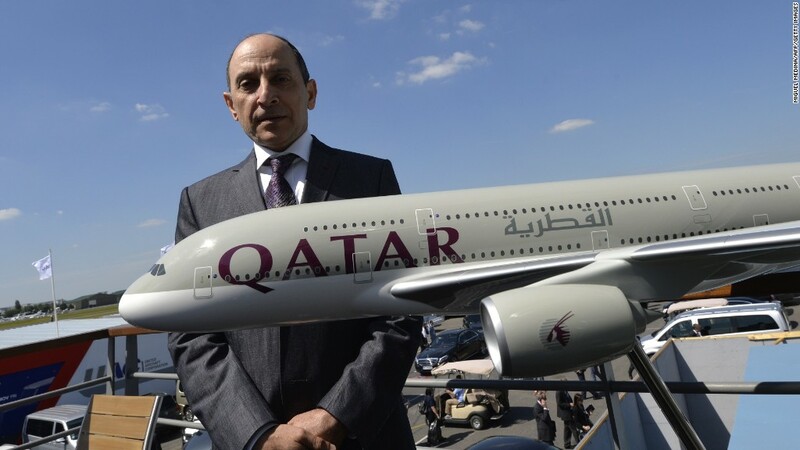 Akbar Al Baker told CNNMoney's Emerging Markets Editor John Defterios that the decision by Saudi Arabia, the United Arab Emirates and other states to sever diplomatic and transport links with Qatar amounted to an "illegal" blockade that the U.S. should be doing its best to resolve. President Trump has endorsed the decision of Gulf nations to ostracize Qatar, even as U.S. Cabinet officials have said it is hurting the campaign against ISIS. "I don't want to comment about President Trump," Al Baker said in an interview in Doha. "I am extremely disappointed." "[The U.S.] should be the leader trying to break this blockade and not sitting and watching what's going on and actually putting fuel on [the] fire." Qatar Airways is one of the world's biggest airlines and the Gulf state's best known global brand. Al Baker has previously described Trump as a friend and fellow businessman who would do what is best for the United States. The airline CEO said he did not expect Qatar to be treated in this way by a country "so dependent on its fight against terrorism." Qatar is home to the biggest U.S. military base in the Middle East. The sprawling compound 20 miles southwest of the Qatari capital of Doha has about 11,000 U.S. military personnel. Qatar has been accused by Saudi Arabia and the UAE of supporting terrorism, claims that the tiny state has rejected in the strongest terms. Qatar Airways has been hit hard by the dispute, with 18 destinations now out of bounds for the airline. Duty free sales at Doha airport are also suffering -- they fell 25% in the past week, said Al Baker. But his big rivals from the UAE -- Emirates and Etihad -- are taking a hit too, he added. "Yes we have a drop in our business, but so does Emirates and Etihad. They may try to behave [as if] everything is normal but they are being hurt as much as Qatar Airways from this illegal blockade." Despite a challenging year that included an electronics ban on flights to the U.S., Qatar Airways has just posted record profit of $541 million for the year through March, an increase of nearly 22%. "We are now looking to increase our frequencies to markets that we couldn't operate because we had a capacity shortage. Now that we are not operating to those 18 [destinations], doesn't mean I'm going to shrink," he said. In addition to closing their airspace to Qatar Airways, Saudi Arabia, UAE and Bahrain have also shut down the airline's offices. "It is actually a travesty of civilized behavior to close airline offices. Airlines offices are not political arms," said Al Baker. "We were sealed as if it was a criminal organization. We were not allowed to give refunds to our passengers." He accused the Gulf countries of violating a 1944 convention that the UAE and Bahrain have signed. Any country party to the convention should grant freedoms including "the privilege to fly across its territory without landing," according to the International Civil Aviation Organization, an agency of the United Nations which administers the Chicago convention. "We have legal channels to object to this," Al Baker said. "ICAO... should heavily get involved, put their weight behind this to declare this an illegal act."